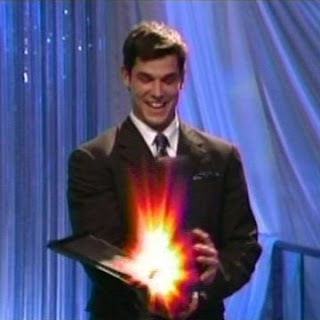 As expected, VJ Logan was proclaimed "America's Most Smartest Model" in the finale of the show, beating Andre Birleanu. VH1 had described the show as a search for "the perfect combination of Beauty and Brains". Van Jameson did well enough in the modeling challenges to put him safely in the top tier of the best models, but it was on the brains side that he really excelled. He may not have had the intelligence or book smarts of a Daniel Schuman, but his application of his innate cleverness blew out the competition and left them amazed and sore (as in a kind of loser). During the taping of the series, VJ faced wild accusations of cheating that never could be connected with any rules being broke or even bent. There were basically two things that instigated the denunciations. One is that most of the contestants had no idea what they were getting into when they signed up for the show. So, when they moved into the model house they just settled into making friends and enjoying a vacation. They weren't there for a competition and they were actually incredulous during the first episode that VJ would study while the rest of them were lounging around. When VJ started to win, some of the other models chose to explain their losing with accusations of VJ cheating rather than bother to step up their own game. The second thing that fueled the baseless claims of cheating was the strategy of Andre. He wisely recognized that he could use these claims as a wedge to turn the other models against VJ, who Andre recognized besides himself was the other Alpha male in the house. It was a great strategy for Andre. He had gotten in fights with basically everyone else and he should have been the most hated person in the house, but instead he was able to make them forget about his own abusive behavior and focus on the mythical cheating. In doing this, the brilliance of the scheme really showed itself. He was able to make three of the final six totally take their eyes off the prize of winning the show themselves and work towards getting rid of Andre's main competition. Andre couldn't lose with this approach. Either VJ would be knocked out or the three members of his alliance would be so confused they would be kicked out before him. Too bad for Andre, but it was the only smart thing he did. The start of the finale show reminded the viewers that the final two models, Andre and VJ, were tasked with putting together a five minute presentation explaining why they were "America's Most Smartest Model". VJ was in his element with spokesmodeling while Andre realized that he didn't stand a chance. Andre remembered that he had received an Edge of a Sony Ericsson Z750 phone and got the idea of calling Jeff Pickel and asking him to do the presentation for him. Pickel listened to Andre's plea and agreed to do it. Pickel explained in a post interview clip how during the show he had come to an understanding with Andre to look past Andre's horrible behavior. Unfortunately, Pickel gave no explanation why he didn't try to make friends with VJ also during the show. The only clues have been comments that Pickel has made about Andre having more experience and therefore by definition being a better model. One of the odd things I have learned about models while watching AMSM has been that they are really snobby about experience level. In most professions, the number of years of experience may be one of several indicators of how good someone is at their job, but in modeling it seems to be regarded as absolutely equivalent. Pickel seemed to have felt that having a young model of only five months outshine more experienced models was a threat to the foundation of the industry and was intent to see VJ put down. It's an unfortunate flaw of Pickel to put this belief ahead of helping the better player win the game. Both Pickel and VJ did a good job presenting. Andre cut off Pickel before the end of "his" presentation and took over. It wasn't a very smart move because he really screwed up his message. After the presentations Andre and VJ were brought back to speak directly to the judges. VJ made use of the opportunity to continue to press his claim, while Andre wasted his time pursuing the cheating argument. Andre seemed not to understand that the judges knew exactly what the rules were and so would not give any credence to that tiresome attack. Later Andre and VJ appeared before Mary Alice Stephenson and Ben Stein to listen to their final critiques. Andre was acknowledged as being the "best" model, but as the best combination of the brains and beauty, VJ was anointed as the one and only winner. At the end of the show, VJ declared that he is so thankful for everyone that believes in him. Well, I've believed him for eleven weeks. I challenge him never to stop trying to be the best and to live up to the appellation of VJ, All-American Boy. One more thing: VJ, try not to talk with so many words that get bleeped out. And don't be afraid to let down the tough guy image sometimes to let the love shine through. When Brett Novek spoke of VJ cheating, I'm absolutely certain that Brett believed that. There's not a dishonest cell in Brett's body. I think his good nature interpreted what would otherwise be considered mild reality show tactics by VJ as cheating. That makes it hard for me to write about VJ because as anyone could plainly see throughout the show, Brett is definitely my favorite. I like to see the nicest guy finish first. I like to think I'm a nice guy too. However, I have to judge VJ in light of the whole reality competition show genre, and in comparison with contestants on shows like Survivor and Big Brother, VJ is practically a virgin. While I hope that VJ enjoys success in the profession of his choice, I think he would do really well in the corporate world, assuming he could overcome his anger problem and bleeped speech. If he had been a contestant on The Apprentice, I think he would have done well there also. For anyone that has a problem with Mary Alice Stephenson, I say go achieve even 1% of her resume in your lifetime and then you might begin to have some credibility to criticize her. She has borne the brunt of being in a terrible situation. One thing is that like all reality show cast members, she is edited to create whatever story the story editor wants to make. Another thing is that the structure of the judging focused all the dislike of any of the outcomes on her. It may be better in the future to have a three or more member panel to spread the criticism around. A third thing is that she had to throw out two hugely popular models: Pickel and Brett. So many people loved the comical Pickel and angelic Brett so much that their departure trigged a lot of vitriol aimed at Mary Alice. The ironic thing is that that type of vicious hostility is so contrary to Pickel and Brett's nature that it is hard to see how one could be a supporter of them and yet speak so harshly of MA. VJ is no angel. He's far from it. I wish that he could become friends with someone like Brett who could show him that there's also benefits from being nice to people and getting along with them. I think it would help VJ's long-term happiness. Shows who your secret crush is man. Rules? How about common human decency. If everyone expected dishonesty no one else would've been so honest I'm sure. Especially since we were dealing with "seasoned" models. Your bias is laughable. I've made quite clear on this blog during the last eleven weeks that my crush, if I have one, would be on Brett, not VJ. The only bias I believe I am showing is favoritism for the best players. I hadn't heard the human decency comment brought up yet, but I'm glad to hear some variety since the cheating comment is so played out. "You choose to be a cheater better than a loser!! Nice, now we're completely different...low lives..."
That makes no sense, learn grammar and then get on your soapbox. VJ sucked!!!! I really hate when people use the excuse that growing up with little makes you more deserving, everyone has there own demons to deal with; thats what i turned me off of VJ that all of his other BS. can't wait for the next series!! VJ is pure poop. Cheesy, Ken type (puke), and totally ZOOLANDER, COMPLETE lack of style. I do get the side about VJ thinking outside the box because it is smart, but its not fair. Skill is not shown or gain by cheating. Thats the flaw of this show and most reality shows. What i do dislike is that VJ cant handle a challange as it is, he needs to get around it the easiest way possible whether it be dirty or unfair. He was in his own elemnt on the Jaguar 07 presentation and he still had to "cheat" to win. Angela did the better job as she did the best presentation without an edge. So please this is about skills, the REAL smarts. I'm sure VJ would have probably done a decent job without his saposed "made edges" but thats the point of a compotition. RAW SKILL. If it were to be an equal battel/competition no edges no nothing, then we would see who the REAL winner is. VJ you need the money, but money wont last forever and your reputation will. Vj was a complete LOSER... he cheated, lied, deceived did practically w/e it took to win. How many other models would want to work with a guy like that, He would steal your moves and do w/e it takes to screw you over for himself to get to the top. Its all about karma, treat others how you want to be treated yourself!! !